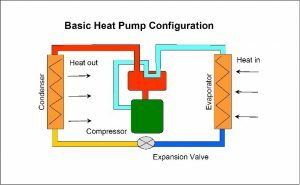 Relay Application in Renewable Energy Heat Systems | American Zettler, Inc.
Trends in renewable energy applications in heating systems include the use of heat pumps that convert existing energy in soil, air or water into useable heat for living spaces. A leading manufacturer of modern heating systems required a relay for a new generation of heat pumps. The purpose of the relay is to bypass the charging resistance in order to limit the start-up current of a motor inverter that feeds the compressor motor. The glow wire version of American Zettler’s new AZSR131 power relay is designed to pass glow wire testing, making the relay compliant with the requirements of IEC 60335-1 for household appliances. 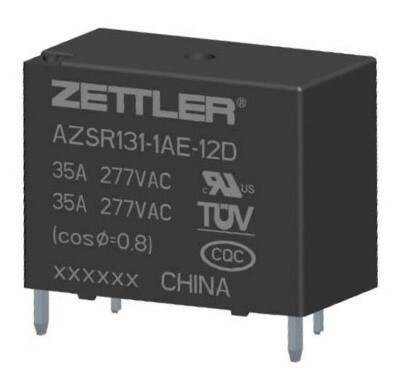 AZSR131 relays have UL and TUV recognized switch ratings of 35A@277VAC at 85°C for 30K cycles. Their usage in heat pump controls demonstrates the versatile applicability of this component, which was initially designed for use in solar inverters where the relay disconnects the inverter from the mains public grid in compliance with IEC 62109. American Zettler continues to play a leading role in providing components solutions for New Energy markets in solar relay and EV charging applications, among others.